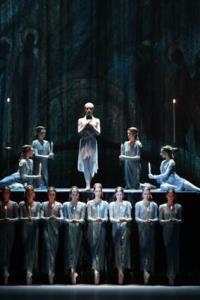 Ivan the Terrible was the last for the 2014-15 season filmed in HD performed by the Bolshoi Ballet Company. Sergei Prokofiev was the composer chosen by Yuri Grigorovich for a film commissioned by Joseph Stalin; a 3 part historical epic of the life of Ivan 1V, the first Tsar of all Russia. First filmed in1944, it was later banned. Stalin wasn't happy with the way Ivan was portrayed, so it was not repeated until 1958. Part 2 was made but not Part 3. The ballet, choreographed by Grigorovich to the music of Prokofiev, opened to great acclaim in 1975, performed throughout the world 99 times until being shelved in 2001. Ravel praised Prokofiev's first ballet as 'a work of genius'. One of his most famous works is the Opera 'War and Peace', the first work for the opening of the Sydney Opera House in 1973. He may be considered the most popular composer of the C20th. He died on March 5th 1953, the same day as Stalin. The brutality and passion of Ivan IV and his descent into madness is relentless and apparent from the first bar of music. He was described by his peers as 'intelligent and devout'. As his violence increases, so does the fury of his dancing. Prince Kurbsky [Denis Rodkin] is also in love with Anastasia, who Ivan choses as his bride. Ivan had 7 wives and 8 children, one of whom he murdered in an uncontrollable rage. The ballet opens with the ringing of bells that dominate the stage. They ring to herald the crowning of Ivan 1V as the first Tsar of all of Russia. The jealous boyars [lords] also have claims on the crown, rebel and go to war. Ivan crushes his enemies, keeps his crown but the boyars want the Tsar dead, so they arrange to poison him. Act 2 opens with a pas de deux between Ivan and his first wife Anastasia [Anna Nikulina] which oozes sensuality. These are beautiful people, living their roles as the music drives the dances on. Tranquillity quickly changes to rage after Anastasia mistakenly drinks the poison meant for the Tsar. To say that Ivan [Mikhail Lobukhin] is in a rage is an understatement. It doesn't seem possible but the pace continues to increase from all, including the Corps de Ballet. Ivan is finally strangled by the bell ropes, representing the unrelenting power of Mother Church. At the risk of spoiling a good story with facts, Ivan died of a stroke while playing chess. The scene changes are executed with clever moving of curtains and lighting which is mirrored by the clothing of the dances. Pavel Sorokin was the musical director who has been working with the Bolshoi theatre since 1988. He sets a cracking pace for the dancers. Ivan the Terrible represents a challenge for both dancers and musicians. It isn't a ballet for the tu-tu lovers, but it is an experience not to be missed and well worth a viewing.